The overcast night’s sky of May 13th, releasing its hard droplets of rain, contrasted perfectly against the brightly colored, soft sculpture forms of Stitched 2. Filled with interpretations of fantastical sea creatures who recently enjoyed freshly warm waters and fur-coated animals newly emerged from hibernation, this group exhibition at the Clutter Gallery felt like a loving tribute to springtime, curated by contributing artists Lana Crooks and Melissa Sue Stanley. Approaching the storefront’s Beacon, NY location, two of the four pieces highlighted in the window display were by Venetta Butcher, who creates her works mainly out of wool textiles. Grey Rowdie sits on the shelf’s edge, gazing at the exhibit with its expressive eyes, its pensive smirk being a brilliantly minimalist addition. Conversely, Butcher’s other piece, Space Cadet: Aten, is almost emotionless, its stance rigid and eyes closed. Depicting the striking form of a nudibranch, with a flower’s bloom emerging from its backside, crawling across a beautifully formed tendril, is the Tentacle Bloom by plushPLAY (Mariangela Tan). While the suckers running the length of the form are breathtakingly crafted, it is the mollusc companion’s contruction that contains a truly inspired concept, as it is affixed by a pin and can be easily repositioned anywhere on the needle felted wool sculpture. Tan’s piece feels perfectly situated next to the Capricorn, a unicorn horned goat-beast with the hindquarters of a fish created by Yeti and Friends (Nana & Cody Williams). An evolution of their recent Yeticorn series, the Capricorn is a perfect example of various materials being all skillfully executed, coming together to form a magnificent whole. Turning from the window display to the main wall, two adorable wolpertinger renditions by Stefani Scoggan, which are the debut pieces in her Baby Wolpertinger line. Titled Moonbeam and Sunchaser respectively, these are the newest additions to Scoggan’s jackalope-inspired series of works under the Lee’s Menagerie guise. With their wings spread wide, their stance conveys that they might be about to take to flight, their tousled faux rabbit fur accentuating the beautifully realistic eyes and nose on these folklore-inspired beasts. Adorned with pom-pom buds and leafy tufts sprouting their hides, the trio of pieces by Horrible Adorables (Jordan Elise Perme & Christopher Lees) have colorful arrays of wool felt scales hand applied over their handmade foam forms. Titled Daisy Doe (Orange), Pufferhedge in Bloom, and Daisy Doe (Green), these surround Keely Benkey-Reichman‘s Rickey Rat creation, a wool and clay construction that riffs on the classic appearance of Mickey Mouse. Situated on a pedestal, Mariangela Tan’s plushPLAY alias is represented by a second piece, the Sea Uniraff Carousel. Mounted on a post with a beautiful seashell topper, this merry-go-round animal is a hybrid of a seahorse, unicorn, and giraffe. With the beast’s body constructed carefully out of needle felting, the pop of color granted by the embroidered saddle blanket is a lovely finishing touch. Cat Rabbit‘s duo of felt characters are anthropomorphic edibles. Lady Sanshoku‘s title implies her tricolored head, as sanshoku is Japanese for “three colors”, the form being a Japanese sweet dumpling treat called bocchan dango, which is composed of three flavored spheres, one of red bean, a second of egg, and the third by green tea. Her companion is Hard Boiled Homebody, a dapperly dressed hard boiled egg-person with warmly lined slippers upon his feet. While both of these are memorable creations, it is the attention to detail in their clothing that truly captures the viewer’s attention. 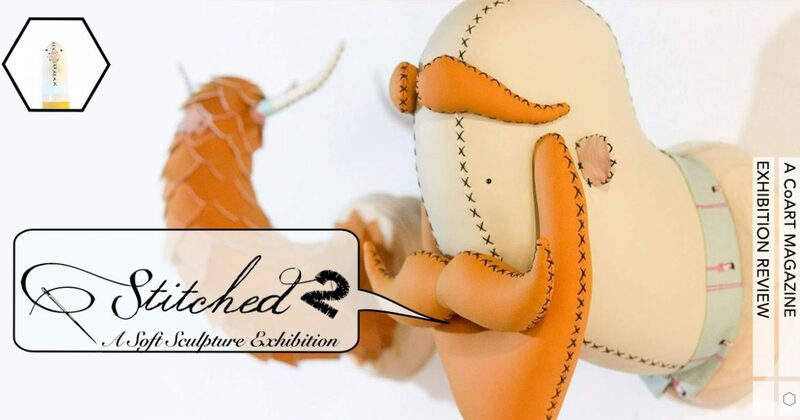 Co-curator Melissa Sue Stanley‘s trio of small creatures are composed mainly of wool and wire, as well as being part of what she refers to as her “Kitchen-Witch” inspired series. Made in reference to the magic contained in everyday cooking items, like herbs, these three are named after the type of hand-stitched plant’s leaves that adorn their wooden plague bases: the purplish Rosemary, the red hued Garlic, and the blue colored Sage. The contributions by Kit Lane, Long Winter for Mr. Raccoon and Desert Bobbaloo, are excercises in the contrast between hard and soft. Long Winter for Mr. Raccoon features an actual skull atop a wool construction of greenery, the emphasis being the bone that is displayed front and center. On the other hand, Desert Bobbaloo prominantly displays one of Lane’s signature pig-nosed creatures, an actual dried cactus stalk placed amid the woolen growths backdrop. The duo behind Twee Muizen, Denís & Cris, exemplify their craft through four faux taxidermied pieces in this exhibition. All imbued with a cartoonish aesthetic by their simple, curved forms, the thick black stitch marks mirror the ink linework of illustrations, there is: the fox-like Zorro, almost made anthropotphic by the addition of shirt at the neckline; the bearded man with a duck head growth is Barbudo Pato, which is Spanish for “bearded duck”; the long-necked Yeti, its horns casting alluring shadows; and the unicorn-esque, narwhal-inspired Orca, its tail brilliantly seperated from its body on the plaque base. These human-like creatures with animal heads are Anna the Fox and Nadia the Unicorn, two carefully crafted one-of-a-kind dolls by Claymate Creatures (Daria Lapto). Their bulging eyes in otherwise placid faces certainly attract attention, but it’s their overall modernized folk art feel that is truly spellbinding, which can especially be seen on Anna the Fox‘s hands, an element that should appear incongruent to the whole but flows seamlessly. Hiné Mizushima‘s series of sea creatures anatomies are testimonies to what can be accomplished with felt and beads. These works, which are respectively titled The Anatomy of Deep Water Clam No. 170515, The Anatomy of Small Ear Squid, and The Anatomy of Deep Water Clam No. 170514, are intricately composed in colorful arrays, drawing the viewer’s imagination into the fantastical undersea realm that these soft sculptures originated from. A masterful mixed media construcion, Lisa Toms‘ Carnival the Chibi Dragon Spirit is an articulating work, it’s plastic armature allowing the beast to be easily repositioned. By being primarily white in color, the spots of colorful metallic hues catch the eye, glittering and glimmering in the light. And while the pristinely executed face with its overly wide eyes intrances one, subtler elements — like the pink flecked translucent horns — will continue to reward viewers over time. The spun cotton creatures by Silk and Thistle (Sara Duarte), titled Prudence, Lyla, and Archie, exude a child-like playfulness, their carefree stances perfectly suiting their preadolescent clothes. But most noteworthy of all is how their oversized heads contain such expressive faces, simple blush coloring highlighting their beautifully sculpted, minimal nature. And the muted colors of Duarte’s pieces perfectly accent the dark shape of co-curator Lana Crooks‘ hand-dyed wool relief, Raven Claw. The Beast Peddler‘s handmade creatures, the faux fur coated Prancer and the velour & linen Muthsheba, bring a sense of adventuresomeness to the exhibition, the pair appearing as wandering travelers about to embark on a journey. At the rear of the gallery is a side wall, adorned with a flock of wool felt birds by Zoë Williams. With the smaller versions being titled Hue Tori and their larger cousins named Wish Tori, these star shape adorned avians featuring crystaline eyes and shimmering beak bases. Under her droolwool alias, artist Maria Filipe Castro contributed two of her wool felt art pieces, both of which would fit perfectly within the cast of creatures on Adventure Time. Cloudine is a cloud headed girl, a spilling forth of pink rain creating the leg stalks upon which she stands, while Cee Cee is a cotton candy gal, her body striped in a peppermint pattern of red and white. Titled Paper Hat Cat (Grey) and Paper Hat Cat (White), this duo of wool felines by Heather Gross not only have paper boat hats but are prepared to race similar constructions that are held in their paws. With beautifully hard feeling galoshes adorning their feet, their wide eyed, simple faces convey a sad pleading alongside a sense of youthful wonderment. And located in the center of this rear display is Crooks’ Spring, featuring a Japanese porcelain flower at its base and a delicately constructed wool bee forever captured in mid-flight, its silken wings beautifully adorning it. With golden and yellow beading accenting its form, and black ones giving added depth to its eyes, this work of art is a magnificent embodiment of the season it is named after. Having had its opening reception on Saturday, May 13th from 6-9pm, all works in this exhibition will remain on display until June 2nd, 2017 at the gallery’s physical location (163 Main Street, Beacon, NY 12508).